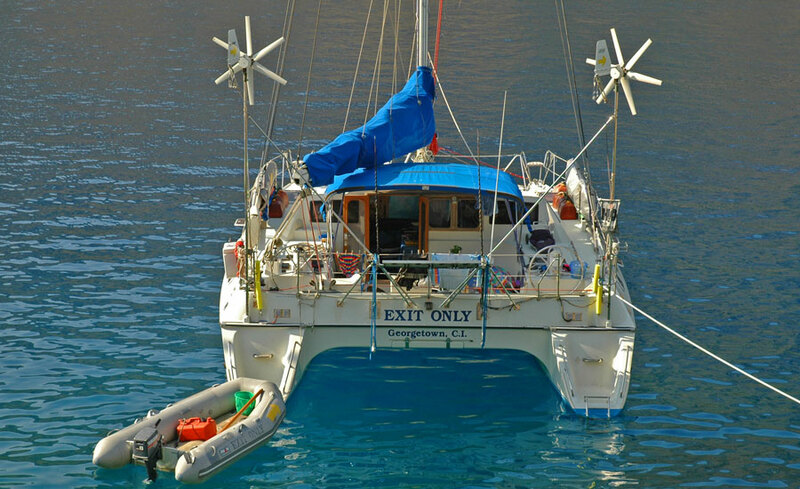 MULTIHULL DVD OF THE SAILING VOYAGE OF EXIT ONLY. WHERE DID THEY GO? NOWHERE? EVERYWHERE? Go west young man, and seek your fortune over the western horizon. Such was the call to 19th century pioneers in North America. The government encouraged westward expansion by offering homesteads - free parcels of land - to those brave souls who took up the challenge. Times are different now. All the land is taken, divided, and subdivided thousands of times, and new homesteads are no more. All that remains are millions of miles of fences and unfriendly walls. Postage stamp size estates with no trespassing signs demarcate the homesteads of yesteryear. Nevertheless, the pioneer spirit survives in the hearts of those who live in Water World. 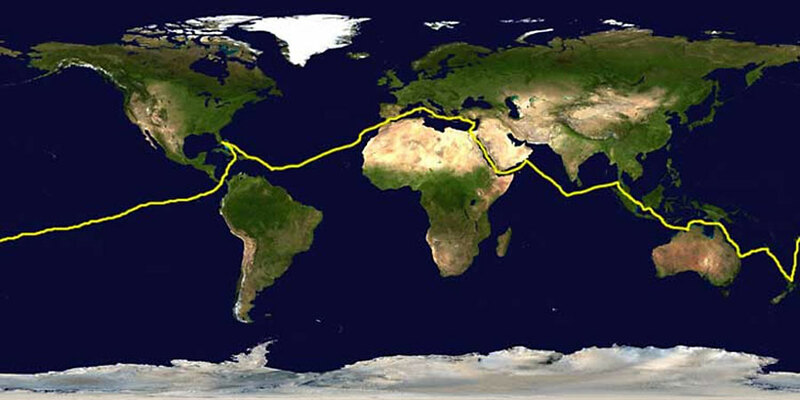 As we sail west around the world, we aren't in search of land. We are seasteading. What is seasteading? Seasteading is a way of life in which homesteads don't exist. You sail on the ocean of your dreams, and wherever you drop your anchor becomes your temporary home - your seastead. The oceans and waterways of the world constitute a massive aquatic seastead in which you are free to roam at will. You may live in the same seastead for weeks, months, or years, or you can change to a new one each day. 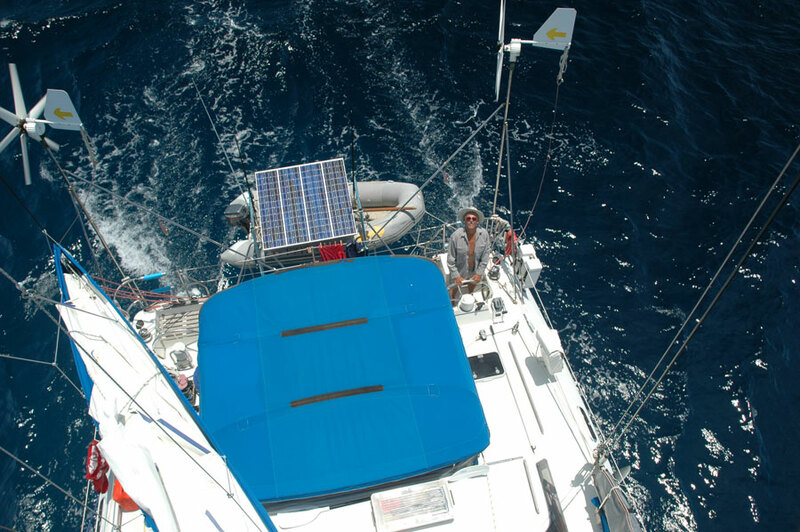 Your seastead may be anywhere from the tropics to the arctic circle - wherever you have the courage to point the bow of your yacht. People who seastead live in Water World. Their home is on the oceans and seas that cover more than 70 percent of our planet. Water World is a vast domain that transcends cultures, nationality, and politics. Seasteaders are politically more neutral than the Swiss, and they come from all the nations of the earth. Linguistic diversity and openness to all religions and cultures are hallmarks of this transoceanic community. Water World accommodates everyone. Our friends are German, French, Canadian, American, Thai, Malay, Indonesian, Australian, New Zealanders, Spanish - an endless ever changing list of seafarers who make seasteads their home, and seasteading their way of life. Most people who seastead aren't on vacation and aren't running from the real world. They have bills to pay and must earn a living like everyone else. The big difference is that in Water World, they don't have a thirty year mortgage on the small patch of ocean where they anchor their yacht. Their seastead belongs to no one and to everyone at the same time. They have as much right to be on the seas or at anchor as anyone else. In his wisdom, God made plenty of water for everyone, and I'm glad He did. Otherwise, there would be water wars. It wouldn't be long before the governments of the world divided the ocean up into smaller and smaller parcels, and seasteading would become a thing of the past. Seasteading still is a viable way of life in most parts of the world. There aren't enough of us sailing that it's worth the time and expense for most governments to closely regulate us. But times are changing. The industrialized nations of the west are constantly looking for new sources of revenue, and if you remain too long in some European waters, they will charge VAT on your boat. Fortunately, it's a big and beautiful world out there with plenty of places for seasteaders to drop their anchors and call home. Seasteading is a great way of life. If you purchase a small seaworthy yacht and save up your freedom chips, it won't be long before you can start an awesome adventure. Your pioneer spirit will well up within you as you hoist your sails and seek your fortune over the western horizon. Where are you Scotty? I need you to beam me up! Actually, I don't want you to beam me up. What I really want is for you to beam up Exit Only and drop her off at Kekova Roads in Turkey. I'm ready for some Turkish cruising. Turkey is the land of good people, great hospitality, and outstanding cruising destinations. We spent two months cruising Turkish waters, and that's far too short of a time to discover all its wonders. 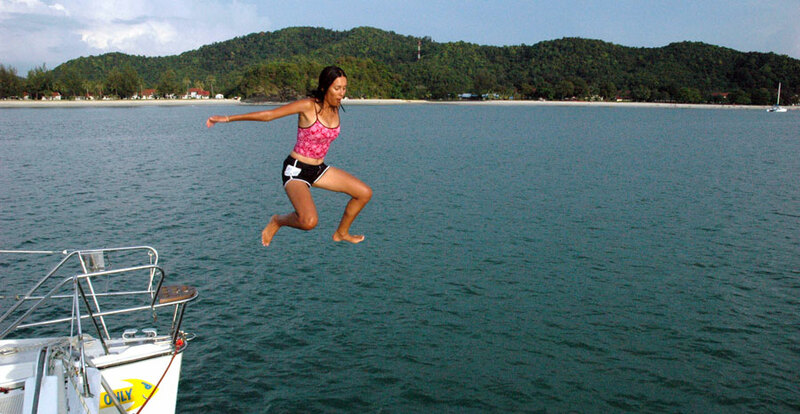 Unlike many cruising destinations, there are thousands of bays and inlets in which to anchor along its craggy coast, and the anchorages are secure. The holding is usually good, and that means you can get off your boat and take a hike or inland trip without worrying about your anchor dragging. While its true you have to take precautions and lock things up in the big cities, out in the anchorages you don't have to worry about night time boarders interested in your cash stash. The only people we know who experienced skullduggery were med moored to quays in large towns where you are easy prey to petty thievery. City thieves are slick operators; when they're in stealth mode, they can clean you out in a twinkling of an eye, and you won't know they were there until they're long gone. But that's not unique to Turkey; that happens everywhere around the world. There are lots of ways to rate cruising destinations, and what's important to a cruising sailor may mean little to a charterer who's more interested in marinas and fancy meals at the end of the day. As far I'm concerned, Turkey gets five stars. It has everything found in other great destination and so much more. Turkey is special because it's different. What sets Turkey apart and makes it head and shoulders above the rest, is that Turkey is interesting. Crusader castles and ancient Greek ruins abound. The ruins of Greece found on the Greek mainland pale in comparison to those found in Turkey. A day trip to Ephesus will blow you away. But you don't need to drive inland to discover the wonders of ancient Turkey and Greece. You can snorkel among sunken ruins all along the coast. If you ever wondered where Atlantis was, look no further. It's lies in ruins beneath the waters of the the Turkish Coast. The crusaders had a special affinity for building castles in Turkey overlooking the water. I suppose seaside castles made a lot of sense, because supplying those fortresses by overland routes probably wouldn't work in troubled times. Crusaders were invaders rather than invited guests, and they had to bring much of their food and supplies with them or do without. Bringing supplies in by sea was definitely the way to go when other routes didn't work. Although cruisers may like the Hard Rock Cafe, they don't like hard rock anchorages. You'll hear nothing but complaints from cruisers about anchorages that rock and roll. When they put their anchor down for the night, they're looking for flat water. We may bounce around the world when we sail offshore, but when we're at anchor, we don't want to rock and roll. 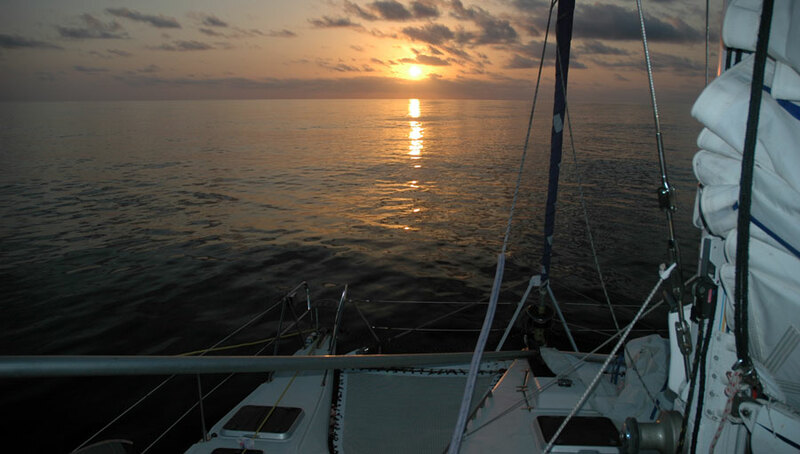 The picture at the top of this page shows a perfect anchorage with a mirror like surface reflecting the setting sun. 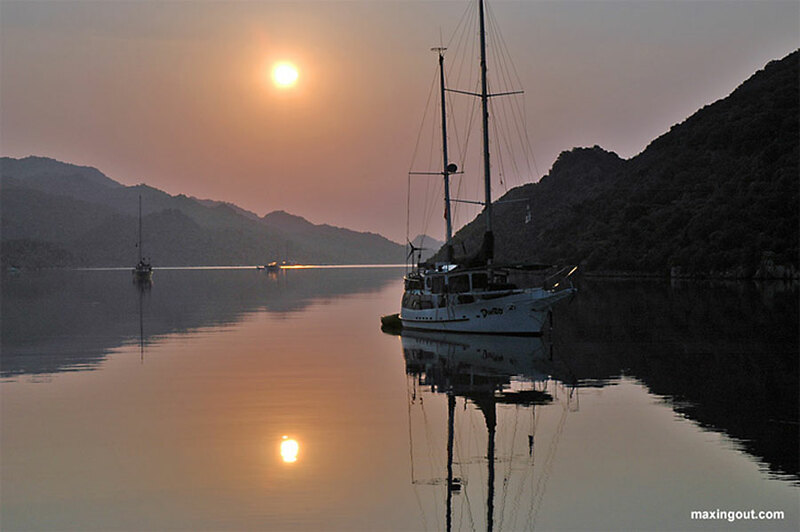 That's the stuff that cruising dreams are made of, and it happens nearly every day in Turkey. Where are you Scotty? I'm still waiting to hear from you. It looks like Scotty is not around, and I'm on my own. Oh well, at least I spent two months living my Turkish dreams. TAKE THE PLUNGE AND ORDER THE RED SEA CHRONICLES. 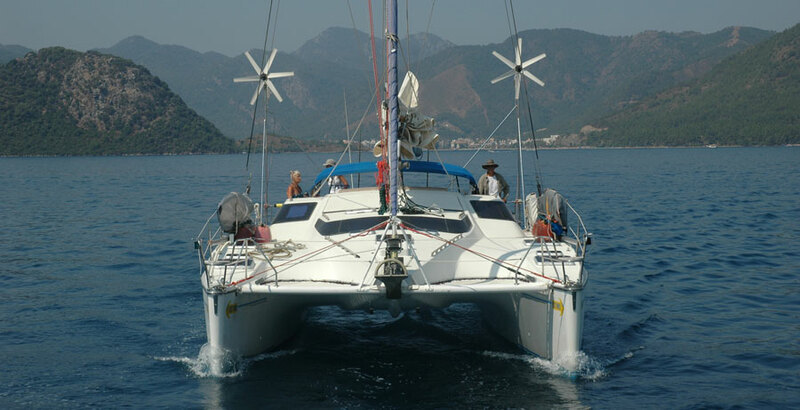 JUMP INTO A GREAT CRUISING MULTIHULL ADVENTURE DVD. YOU WILL BE GLAD THAT YOU DID! 10. 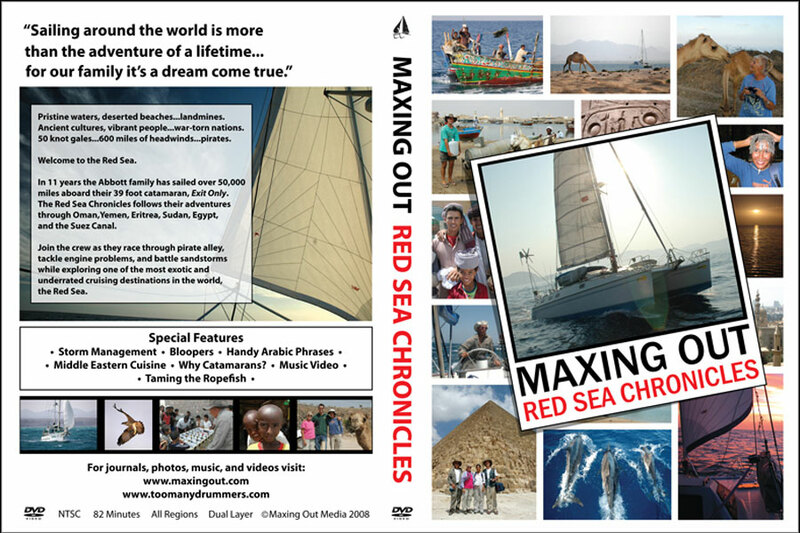 The Red Sea Chronicles is an affordable gift for the sailor in my life. Where else can I get a totally awesome gift for only twenty bucks?